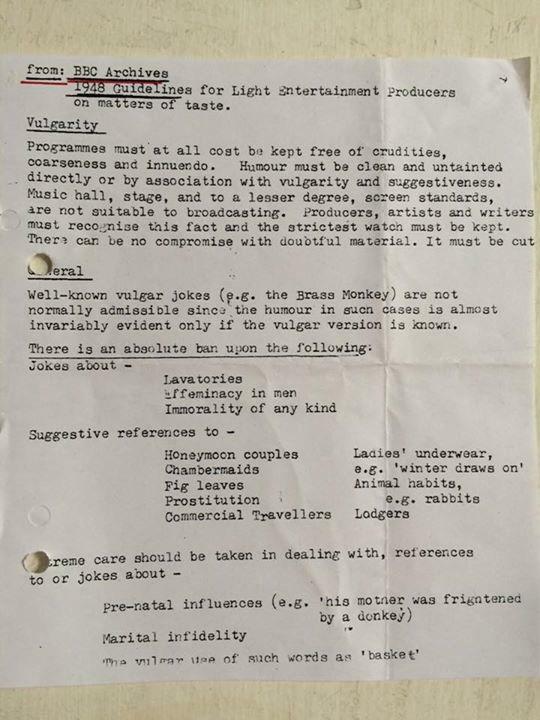 The BBC's 1948 style guidelines: Variety Programmes Policy Guide for Writers and Producers. The BBC’s press office told me, over email, that the page looks like it came from The BBC Variety Programmes Policy Guide For Writers and Producers, published in 1948. Although the BBC spokesperson couldn’t confirm this theory, I think this sheet was probably printed up for the amusement of employees in the more free-and-easy 1970s. The BBC reprinted the entire document as a book in the late 1990s; it’s now out of print, but here is a version in PDF. The longer document includes provisions that are less overtly amusing than this section but are interesting nonetheless, offering guidelines on libel and slander, religious and political references, and jokes about physical and mental disability.